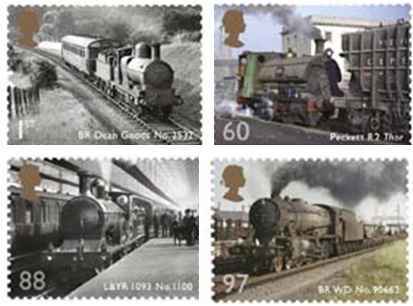 On 1st February 2011, the Royal Mail of the UK issued a set of four stamps to pay tribute to those rugged, smoky and steamy steam engines of the yester years that once hauled heavy load of bogies across the UK and even in foreign lands. Although, these still continue to ply is some countries, these gave way to the emerging technologies in diesel and electric engines in the 60s. The stamps measuring 41mm x 30mm on a sheet of 179mm x 74mm were designed by Delaney Design Consultants with a perforation size of 14.5 x 14. The photos of the engines (top row left to right) includes BR Dean Goods No. 2532 and Peckett R2 Thor, while the lower row shows L & YR 1093 No. 1100 and BR WD No. 90662.